This will be the final post in my How to Journal series. The last few posts focused on leaving a legacy … using journaling notes, old photographs, and memorabilia to craft family stories that preserve our values and milestone moments for future generations. Hopefully the information from previous posts have helped address the first issue. 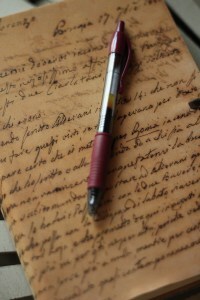 In addition, there are several books and websites devoted to journaling prompts – simple questions or ideas to help uncover hidden memories worthy of written investigation. Today I’d like to address the second issue. Many would-be journalers falsely believe they cannot write. This is more likely due to an old high school English teacher who marred each assignment with red scribbles identifying a multitude of grammatical errors. Those red marks morphed into an inner censor who now belittles any writing effort. On behalf of all English teachers out there – and I’m one of them – I apologize. I fear we have inadvertently squashed the dreams of many fantastic authors. We focused on the mechanics of writing rather than nourish the storyteller. Yes, grammar is important, but software programs can help overcome those deficiencies. What we need – what the world NEEDS – are your stories. So in an effort to erase some of the red marks imbedded on your brain – and encourage you to pick up a pen and simply tell a story – here is a list of some suggestions to help craft an essay that others will want to read. One essay – One subject. Focus on one specific story, topic, or theme you wish to develop. Don’t try to convey everything at once. Several focused essays are more powerful than a long rambling one. Try to boil down the essence of what you want to say to one sentence – that one sentence will reveal your focus. Draft then Edit. Writing the first draft is for you. This is the time to let the ideas flow without censorship. Don’t worry how to express them, just get them down on paper. Here’s the thing: you cannot draft and edit at the same time. The free-flow of ideas comes from the right side of the brain; the analytical editor resides on the left side. If you try to multi-task, creativity will be held captive. So enjoy the first draft, knowing you will sit down again to revise. Think Like a Reader: While the first draft is for you, all subsequent drafts are for the reader. This will require revision of the original essay. Again, don’t associate revision with the evils of high school English, but rather, embrace the opportunity to craft the story. Try to put yourself in the readers’ shoes. Have you included all pertinent information (or have you made assumptions that need to be explained); Have you answered the question – So What? Have you given the reader an opportunity to care? Authentic Voice: We all have a distinct personality and world view. This is expressed as “voice” in writing. Don’t try to write like someone else. You don’t have to write with a dictionary by your side – simply write using your everyday vocabulary. This is not a formal research paper; be relaxed and informal. You want your writing to be an extension of yourself. You want future generations to feel as though they know you by your written expression. Show don’t Tell: This is a classroom term, but it is worth mentioning. Readers relate to writing when they can put themselves in the story. This is accomplished through sensory details: see, hear, smell, taste, touch. Rather than just mention the freshly baked cookies, include the cinnamon aroma, the chewy texture, the colorful sprinkles. You don’t have to go overboard. One or two specific details will help the story come alive. Don’t be redundant: I must confess, this is a pet peeve of mine. But I truly think if a writer strives to eliminate redundancy, the reader will appreciate and enjoy the story. We all have favorite words that we tend to use over and over again. This is fine for a first draft, but when revising for the reader, try to find an appropriate synonym every now and again. In addition, don’t feel you need to repeat the same idea, especially in a short essay. Instead, elaborate on the idea with a telling example or a sensory detail. Variety is the spice of life – and the necessary ingredient to a compelling story. Use spell-check/grammar-check software: The final step in the writing process is to edit. That is, review the text for any spelling or grammar errors. Don’t cringe… this is not as painful and shaming as it was in high school. The Word processor program has a built in spell-check (red squiggle lines) and grammar-check (green squiggles) tool to help identify problem areas. The software is amazingly accurate, and it takes just a few minutes to make any necessary changes. Good writing keeps the reader engaged; too many mechanical errors distracts the reader. This is by no means an exhaustive list, nor is it meant to be used as a textbook for English students. Rather I hope this list serves as an encouragement to those who want to write – but have always thought it impossible. Everyone can write. Everyone has a story to tell. Please… let the world hear yours.